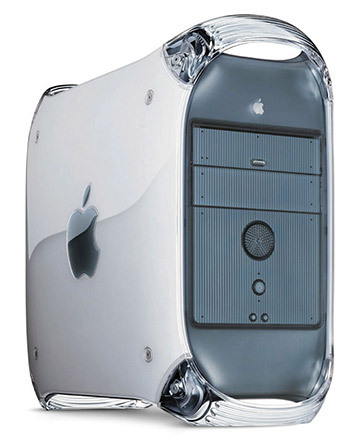 The Power Macintosh "Power Mac" G4 733 (Digital Audio) is powered by a 733MHz PowerPC 7450 G4 processor including "Velocity Engine" vector processing, 256k level 2 cache and 1MB of level 3 backside cache. Base system configurations had 256MB of RAM, a 60GB Ultra ATA/66 hard drive plus a 4X AGP NVIDIA GeForce 2 MX graphics processor running 32MB of SDRAM plus an optional AirPort (802.11b). Optical drive options were either a 2X DVD-R/CD-RW "SuperDrive" or a 8X CD-RW drive.